Today is the day. This afternoon K fiiiiinally goes back to school. It’s the best day ever. For both of us. She’s been dying to go back to her favorite teacher in the whole wide world and I’m dying to have her there while M takes a nap and I do things. I have a billion things I want to do. However… I know that there are two likely scenarios. A) I’ll put M down for a nap and it’ll be one of those days where she refuses to cooperate and I’ll have to do deep breathing exercises to chill out from the frustration of a non-napping toddler or B) She’ll nap and I’ll sit on the couch and zone out from the complete strangeness of such a quiet moment and get nothing done. Last year at this time, in the midst of all of the moving and home remodeling chaos, I realized that I’d have to make a choice and I wondered how we’d feel about school at this point. K missed the kindergarten cutoff where we live by about 2 weeks, so I had to decide whether to have her tested to push her on into school and make her the youngest in her class, or accept that she would be among the oldest in her class a year later. Why does that feel like such a weighty decision? One one hand, I think she’d be fine either way. On the other hand, is she going to be kicking and screaming to get out of the house in 13 years? And in this moment, alllll but one of her classmates from last year has gone on to big kid school. I wondered whether she’d be upset about that, but she hasn’t really seemed to notice. Adrianna’s Z and my K are a month apart, but will now be a year apart in school. Weird. But since our family is finally together under one roof, I’m happy with the flexibility of another year of preschool. I wondered whether I’d be ready to pay off someone for K to be in school all day– she’s such a curious and adventurous kid (read: non-stop supervision) that a year ago I thought that sounded like heaven. But a year of growing up has lengthened her attention span and expanded her ability to play independently. Now we both spend time working on our “projects” and that makes both of us happy. Since K’s birthday is coming up, and she’s getting new colored pencils that will need a place to hang out together. 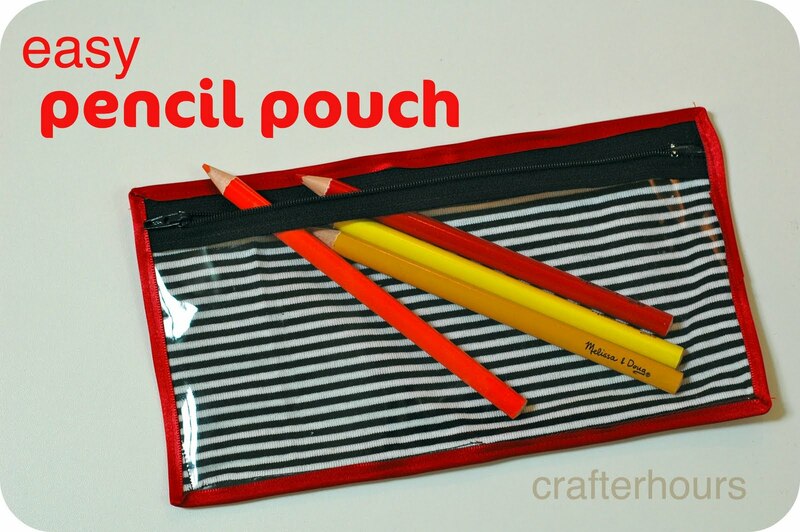 So I’ve invented… the pencil pouch! Okay, yeah, not really. But I’ll show you how I made this one, much like the upcycled t-shirt pouches here and here, that has a stretchy knit on one side and clear vinyl on the other. Jennifer has the full tutorial today over at Meremade for you as part of her Back-To-School Month. If you’re wondering why I don’t love K as much as my godson’s mother loves him, it’s because Prismacolor pencils are round and they roll. Off the kitchen/craft table and onto my tile floor. One, I don’t want to pick them up or add to my list of things to nag about picking up, and two, when pencils fall the lead inside breaks. That’s why you sometimes have to sharpen it 47 times as your lead keeps breaking while you’re trying to use it and you can’t believe how easily it’s breaking since you’re hardly pressing on it? Makes me crazy. And my two aren’t ready for that level of discussion of how things work. Since I’ve really, really loved these, I decided to get the triangular pencils, too. Will file a follow up after we’ve fully tried them. P.S. Liam came home on Friday! He and mom and dad are finally together under one roof and really getting to know each other. I’m trying not to bother Katie with 12 phone calls a day asking the same thing: “What’s happening now? ?” But they’re home and healthy and happy. At long last. totally awesome pouch! and I so understand your schooling/napping dilemmas! Love that! I will have to try this one. ps. I’m having a GIVEAWAY on my blog for anyone who is interested!